Home > News > Food and drinks > The only recipe you’ll need for this Easter! The only recipe you’ll need for this Easter! 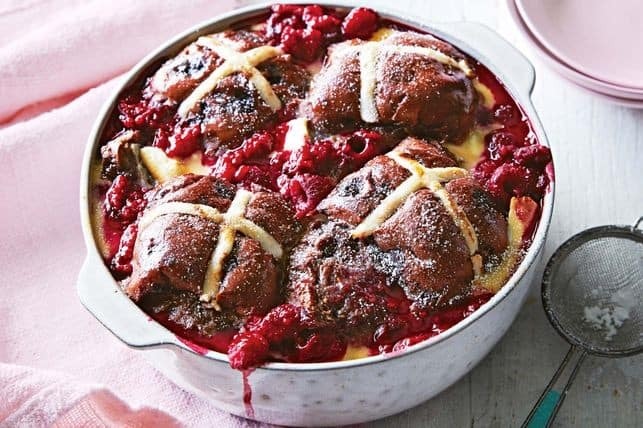 Combine fluffy hot cross buns, creamy white chocolate and sweet raspberries to make the best-ever Easter dessert. Step 1 – Preheat oven to 160C. Lightly grease an 8-cup (2L) ovenproof dish. Step 2 – Spread the cut side of each bun half evenly with butter, then spread with jam. Arrange in the prepared pan, alternating the bases, jam-side up with the tops, cross-side up. Sprinkle with raspberries and white chocolate. Step 3 – Whisk the egg, milk, cream and sugar in a large bowl, then strain through a fine sieve into a jug. Pour the custard mixture evenly over the buns. Set aside for 15 mins to soak. Step 4 – Place the dish in a large roasting pan. Pour enough boiling water into the pan to come halfway up the side of the dish. Bake for 35-40 mins or until custard is just set. Set aside for 5 mins to cool slightly before serving.